Tech N9ne Presents Stevie Stone – Rollin’ Stone just got a jolt of energy from the new music video for the song “808 Bendin'” featuring Tech N9ne. The track that’s already rattling trunks across the country gets a flashy video treatment from director Dan Gedman and Liquid 9. This video has all the glitz, girls and flash that you would demand for an urban smash such as “808 Bendin” . Tech N9ne turns in one of his most charismatic on-screen performances in recent memory as he tears through his schizophrenic and unpredictable verse. 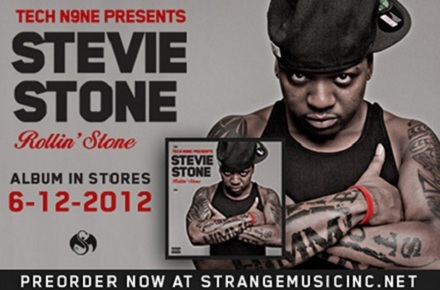 The video is a new look for Strange Music and sets the stage for Stevie Stone to go worldwide with his unique take on the club banger. Click here to watch the music video for Stevie Stone’s “808 Bendin” on XXLMAG.com.